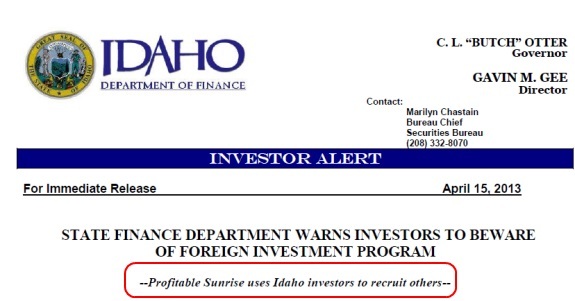 The state of Idaho says the Profitable Sunrise “program” used investors in the state to recruit other investors. And because Profitable Sunrise also was in the business of recruiting pitchmen to sell unregistered securities in addition to offering preposterous returns, Idaho’s Department of Finance noted that the pitchmen could have exposure. “Those investors who receive compensation for soliciting other investors may themselves be subject to the licensing and anti-fraud provisions of state and federal securities laws,” said Gavin Gee, director of the Finance Department. The unofficial tally of U.S. states and provinces on Canada taking action against Profitable Sunrise now stands at 35. The SEC also has taken action, including a notice that it had arranged depositions. The court docket in the SEC case suggests the agency had entered at least 11 evidence exhibits as of April 15. Purported Profitable Sunrise operator “Roman Novak” was a no-show at a federal hearing yesterday in Atlanta. 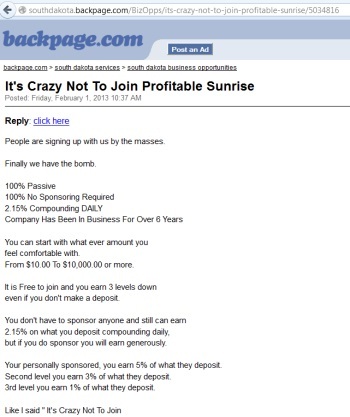 Regulatory filings in Colorado say that Profitable Sunrise was pitched in part through classified-advertising sites. In court filings on April 4, the SEC said Profitable Sunrise pitchmen may have pushed the “program” without even knowing for whom they were working. Tens of millions of dollars may have been directed to Profitable Sunrise, the SEC said.